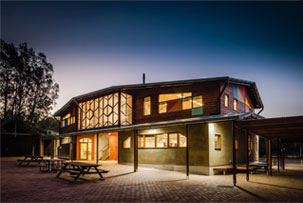 The Regional Meeting for the Australian Association for Rudolf Steiner Early Childhood Education was held on Saturday 19h March 2016, at Cape Byron Steiner School. Presenter Sandra Frain brought the room of around 30 participants a creative, informative and humorous workshop on preparing a biodynamic compost and liquid preparations. Through story, song and poetry, Sandra wove in the impulses of the animal world, the plant kingdom and the forces of the cosmos and the role they play in the creation of the beautiful, rich, living compost. As parents of children attending CBRSS, and early childhood educators working at Periwinkle Preschool, it was great to be actively participating in making a practical contribution to the School. The children will benefit from the fruits of our enthusiastic work as they can add preps to the soil and participate in the unveiling of the compost and spreading it around the vegetable gardens. We all felt a connection with the land around the school and each other as we worked together to spread the biodynamic liquid preparations (500 and 501) around the Kindergarten. It was refreshing to be encouraged to really get dirty, and feel the mud and earth below us. Sandra’s enthusiasm during the workshop was totally infectious. We laughed as we worked together, we sang and we shared stories and experiences as a group. Not only did we learn ways to nurture and honour the earth around us, we finished the day nurturing and honouring each other with lemon foot baths and hand/foot massages with Anthroposophically prepared sphagni moss lotions. All the staff from our Preschool felt informed and nourished by Sandra’s work and play. Many thanks to Sandra Frain and the Kindergarten staff at Cape Byron for a great regional meeting. Kellie Dean, Bess Pegram Jones, Simon McLean, and Cynthia Harris. From the Principal Ocean Shores Art Expo: Calling all Artists!